Hard day at the zoo. Our daughter Bec has always loved animals. Ever since she was a little girl animals have sensed this in her. They find and come to her on a regular basis. When she was a teenager she developed a special affection for horses. She wanted a horse of her own so very badly but since we lived in town on a small property it was never a possibility in our yard. Becky did manage extract a promise from us that if we ever got an acreage we would allow her to get a horse of her own. She grew up, moved away and eventually got married. That was a promise we would never have to keep. Or so we thought. Fast forward more than ten years. We purchased our small acreage to build our shop nine years ago. The land was not big enough for a full size horse, but it would accomodate mini horses very well. Bec reminded us of our promise made when she was a youngster. How could we possibly deny her wish and reneg on our promise? The first mini was a sad case, actually a gift for Janis. It arrived in a mini-van. It had been starved and neglected by it's previous owner. Over a long while, Bec and Janis nursed Glee back to health. Other minis of Bec's joined the herd. But Bec saw a real need in the miniature horse community. Horses needed special care. We only had room for a few and pretty soon they were coming to our little property for only as long as necessary, then moved on to permanent, good and loving homes. It started small or course. But word of Bec and Janis' kindness quickly spread. Our small property was dubbed Pipsqueak Paddocks. Other kind hearted and generous people took notice of what was going on. They wanted to help. And so Pipsqueak Paddocks became Pipsqeak Paddocks Minature Horse Haven Society - a registered charity. 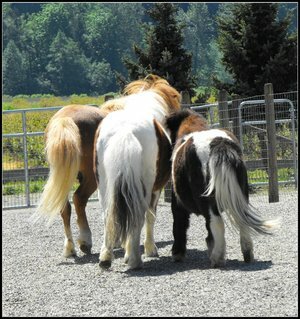 http://www.pipsqueakpaddocks.com They rescue and accept surrendered miniature horses. Some merely need good homes, others desperately need lots of love and care before they are ready to send along to a loving family. My involvement is very minor. I run the tractor when they need it or hook up the horse trailer when horses need to be ferried around. Sometimes I help get hay, repair a fence or other small chores. The real work is done by Becky, Janis and a team of volunteers. I look out my studio window, watch the minis as they come and go. Many come broken and wounded but with the boundless love and care they recieve I witness true miracles on a regular basis. I am fiercly proud of the hard work Bec and her team do every day. While we can't fix the entire world, by doing her best for these animals in need Bec is making a big difference. Late yesterday two especially tough cases came to Pipsqueak Paddocks, our ninety-second and ninety-third horse to arrive. It didn't look good. The vet and farrier arrived early this morning. Both horses had suffered severe leg injuries in the past but gotten little care for them. Sadly, one of the little horses could not be saved. The other faces months of care, treatment and rehabilitation. Today my heart was sad as I witnessed the ladies make some very tough decisions in the name of love.